China Untold: American Dream vs. 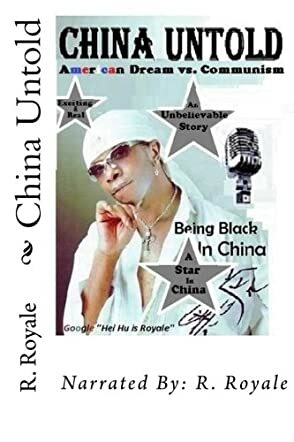 Communism by R. Royale is an autobiographical book that describes R. Royale’s life and experiences as an African American man in China. China Untold gives a unique perspective on working and living in China and the story starts off with R. Royale’s background. He then meets a Chinese girl online and that, combined with his interest in the region and wanting to promote his music career, leads him to China. After that, we learn about his gradual introduction to that world and culture where communism still rules as he works as an English teacher, then slowly makes inroads as a songwriter and music producer in the Chinese market. This is his story told in his own words to provide a close glimpse into Chinese society. China Untold: American Dream vs. Communism by R. Royale is a memoir written in a casual style that feels like everyday conversation. Reading about R. Royale’s initial experiences in the Jinan area of China gives us an interesting glimpse into the local societal norms. His relationship with his girlfriend, who is Chinese, also provides information about the dynamics of gender in Chinese society. As his music career takes off, the differences between capitalism in America and communism in China are made more obvious as seen from the point of view of an American. The photographs in this book are also a nice added touch to the overall feel of his story.